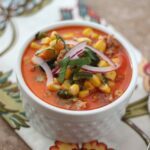 Poblano chiles and chorizo combine with plenty of sweet corn to make this Chorizo Corn Chowder. This recipe was a favorite from the first bite. Surprisingly hearty without being heavy, my whole family gave this meal two thumbs up the first time I made it. Even my three-year-old son had no trouble with the heat in this dish. I love the combination of flavors in this chowder. There is spice from the mild poblano peppers without any real heat. Don’t skip the squeeze of lime over the top of each bowl, it really makes a difference. Over the past few years, I’ve learned to double this recipe whenever I have the chance. I love having some left over for lunch the following day. Kitchen Tip: I use this baking sheet and this pot to make this recipe. Preheat the oven to broil. Move the top oven rack to about 6 inches from the broiler. Place the chiles on a foil lined or well greased baking pan and broil for 15-18 minutes, turning over every 2-3 minutes. (Set a timer and be ready to turn them several times.) You want the chiles to be soft and blackened all over when you remove them from the oven. Transfer the roasted chiles to a dish with a lid (or a dish that can be tightly covered with foil). Cover and let rest for 10-15 minutes. The blackened portions should peel right off after resting. Peel and seed the chiles and chop into 1/4" - 1/2" pieces. In a large pot, cook and crumble the chorizo over medium heat, about 6-7 minutes. Drain the grease well and add the corn and broth. Bring to a boil and then reduce to a simmer just until the corn is tender and warm. Add the cream and poblanos. Stir and cook for about 2 more minutes, just to blend the flavors. Taste the broth and add salt and pepper, to taste. Scoop into bowls and top with onions and basil. Serve with a wedge of lime for squeezing on top. Enjoy! Made this for dinner last night. The lime makes it perfect! Thanks!!!! I want this! Bad for dinner! 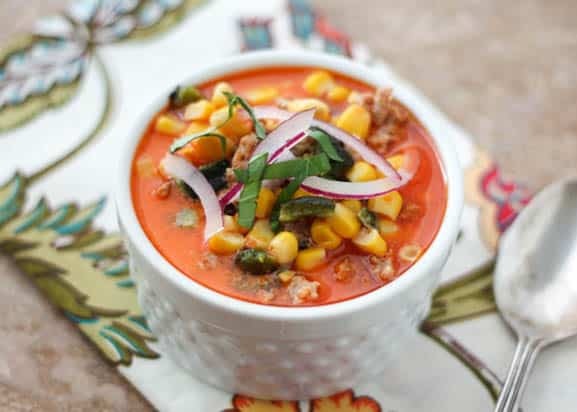 I could eat a big bowl of this soup right now! It is beautiful and I love your garnishes. The broth looks wonderfully rich. Thanks Mary! 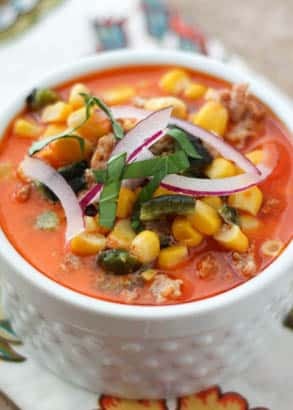 Poblano and chorizio? Absolutely, yes please!